This larger painting is complete. I liked the composition of it with the three dogs. The background gave me a few sleepless nights. I also like the composition, shows off their skinny legs! Gosh, they do have skinny legs! Their anatomy is so different from other dogs, it was challenging to get it down. What a gorgeously successful work of art, Maria. The owner(s) will be thrilled. Your background is perfection in my opinion! OH thank you, I sweat a bit over the background, must practice some landscapes I think! 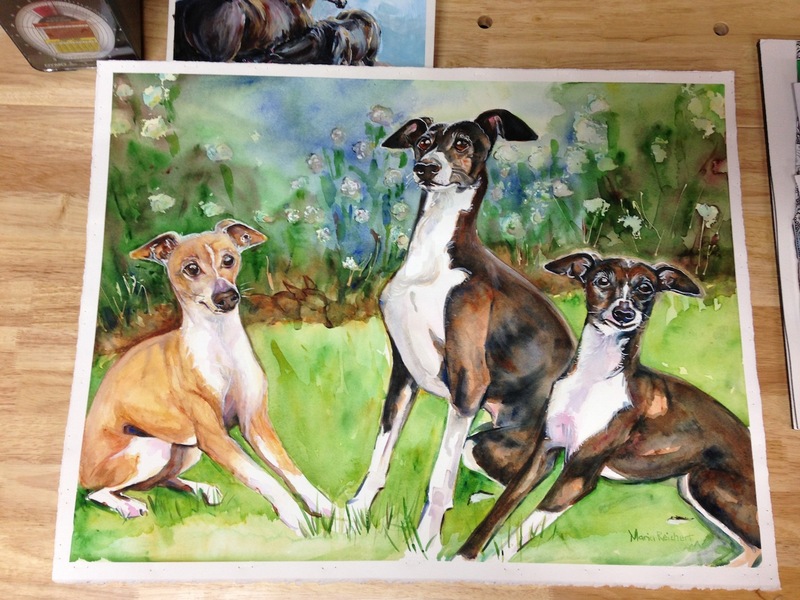 I love this - you really captured the personality of these dogs and great choice on the background technique. Thanks Margaret, that means so much to me, this one was challenging for me and I appreciate the positive feedback so much.